Low FODMAP Peanut Butter Cup Overnight Oats | Ignite Nutrition Inc. 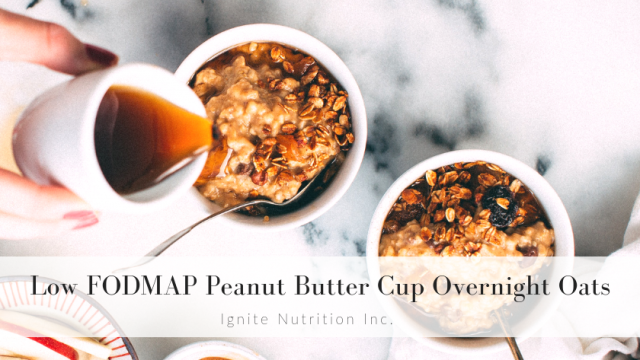 These low FODMAP Peanut Butter Cup Overnight Oats are a go-to in our house (and a HUGE hit on our 5 day low FODMAP and gut health menu plan). We created these for the Husky Wellness Fair event in 2018.
it’s versatile! Switch up the ingredients for what’s in your pantry! It’s a good source of resistant starch, good for your gut microbiota! Divide ingredients amongst 4 containers. Grab and go in the morning – I like to top mine with a banana for fruit! 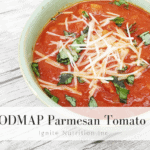 This recipe has been adapted from That Clean Life to have a bit more protein while still being low FODMAP! Top with fruit, I like raspberries or a banana!